data show youths driving less. blame the internet? In 1978, half of the 16-year-olds and three-quarters of the 17-year-olds in this country had driver’s licenses. Thirty years later, it’s a different story. 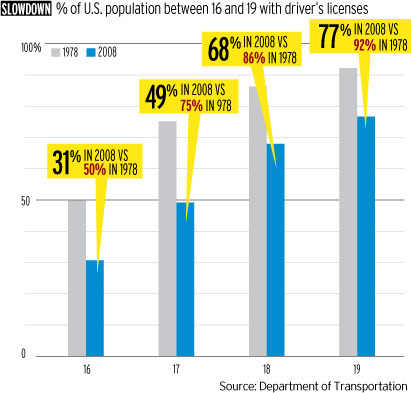 Among the 16-year-olds in 2008, less than a third had driver’s licenses; among 17-year-olds, not quite half did. That data from the U.S. Department of Transportation has caught the muse of the Advertising Age, which recently raised the question: Is the digital revolution driving the decline in U.S. car culture? William Draves blames the internet. Mr. Draves, president of Lern, a consulting firm which focuses mainly on higher education, and co-author of “Nine Shift,” maintains that the digital age is reshaping the U.S. and world early in this century, much like the automobile reshaped American life early in the last century. His theory is that almost everything about digital media and technology makes cars less desirable or useful and public transportation a lot more relevant. Texting while driving is dangerous and increasingly illegal, as is watching mobile TV or working on your laptop. All, at least under favorable wireless circumstances, work fine on the train. The internet and mobile devices also have made telecommuting increasingly common, displacing both cars and public transit. This entry was posted in transit trends by DART. Bookmark the permalink.